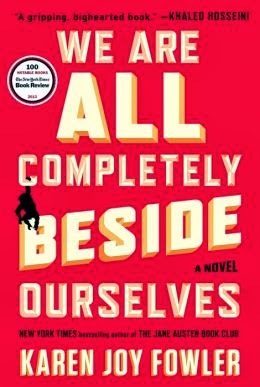 a book chick: "We Are All Completely Beside Ourselves"
"We Are All Completely Beside Ourselves"
my take: I read Ms. Fowler's The Jane Austen Bookclub several years ago, and it was so so. I am a sucker for ANYTHING Jane and it was worth it for that (as was this). When I saw this sitting on a table with a couple other great books I'd read AND it had this fabulous title, I was a goner. I thought this was tremendous. Seriously, I bought it for the title. I didn't even read the back of the book. Interesting subject matter, good characters, and well-written ... the story unfolds in an unconventional way. I'm not going to tell you any more. I wish it were a Book Chicks pick as it would make a great discussion in the same way I thought State of Wonder would be. my source: The Hidden Lantern bookstore in Rosemary Beach, Florida which is a GORGEOUS store with FABULOUS books. Go there if you're within 30 miles. Really. OK, can't wait to borrow this one too! And my book club needs a fiction pick - definitely suggesting. Time to get them to do something I want to read (finally made it through Desiree but not all that happy to have spent so much precious reading time on that when my list is so long).